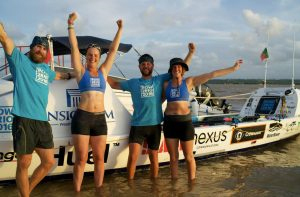 The Row2Rio team were ecstatic to have landed in Brazil on Saturday after almost two months at sea, photo courtesy of Rio2Rio. The team were said to be ‘weary but ecstatic’ as they walked on dry land for the first time in almost two months, but received a warm welcome by a crowd of family and friends. The group left the Olympic Park in Stratford, London, on January 9th and cycled 1,495 miles to Lagos in Portugal. From there they boarded their rowing boat and set off for Brazil. Having landed in Brazil, they will once again get on their bikes to complete their challenge by cycling to Rio de Janeiro. They hope to arrive in the city in a month’s time. Susannah, no stranger to demanding rowing, is currently the Guinness world record holder for the youngest female to row the mid pacific in a team of four that rowed from Monterey in California to O’ahu in Hawaii from the 9th of June to the 5th of August 2014. Susannah was awarded a University Pink in 2015. The Trinity Pink, designed to correspond to the Light Blue of Cambridge and the Dark Blue of Oxford, is awarded on individual sporting merit which is generally assessed in terms of outstanding club performance, representative selection or external achievement. Susannah, already a Cambridge Full Blue having rowed in the Women's Boat Race against Oxford, came to Trinity in 2009. Her contribution to the sport, to Trinity and especially to Dublin University Ladies Boat Club in her 5 years in the club has been remarkable. As well as winning numerous University Championships, countless pennants, 2 Senior Colours and representing Ireland at the Home International Regatta, Susannah has also excelled in her studies, completing an MSc with Distinction in Biodiversity, a PhD in Botany, all the while holding committee positions both as DUCAC Vice Chair and DULBC Development Officer at the same time. The trip has been three years in the making and has cost close to £75,000. The money has been gathered through sponsorship, personal contributions and loans. The challenge is in aid of Macmillan Cancer Support charity who the team are raising money for. To keep up with Row2Rio’s progress, like their Facebook page and follow their blog. To donate, click here.